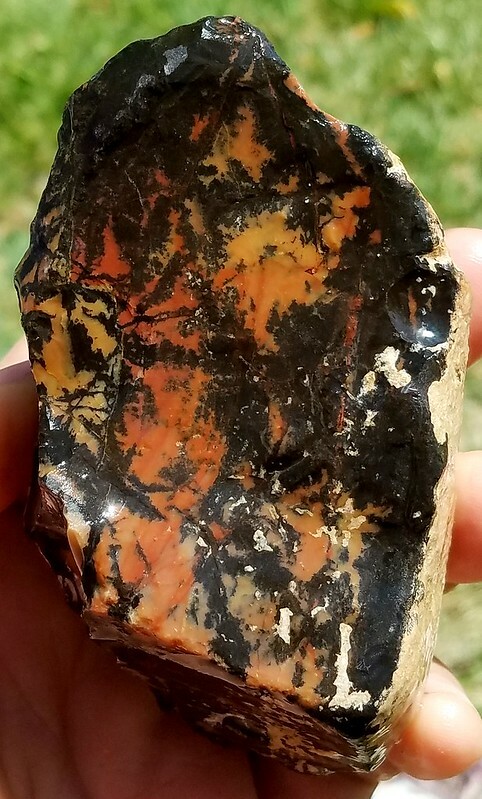 I had this posted elsewhere and I posted it as an obsidian, which is what it looks like to me but a poster said it was porcelain jasper. Any opinions? How hard is it? Streak? I did not test those and I am not home to check right now. Will check those when I get home. Cannot scratch it with a quartz crystal and leaves no streak on an streak plate. The orange colors are right for cheetah "agate" from Brazil. Doesn't have the black spots, but maybe it could be from a transitional zone or edge of a deposit where there was more black. I can't think of anything else with those shades of orange in that hardness range. Jasper, Did you find it or buy it? There is a variety of jasper found through out Nevada. This was found in Central Nevada. I found this in Central Nevada. The area I was searching is supposed to have a bed of obsidian, which is one of the reasons I thought it was an obsidian. But hardness does seem to rule that out. I did find some black agate, orange chalcedony, some butterscotch colored jasper, some miscellaneous other jaspers, common opal and andesite in the same area. Well then, some kind of Nevada Jasper it is... .
Should be super brittle and flake off with the characteristic obsidian break if it is obsidian. From what I can see on the edge does not look like the fractures have that volcanic glass look. Perhaps you should see if it can take out one of the white walkers, that would prove it is dragon glass, right? Nice piece in any case! That dip on the right does look a lot like how obsidian flakes. The hardness rules out obsidian though.